On this website you will find a collection of resources and articles concerning the history of the broad green movement in the UK. 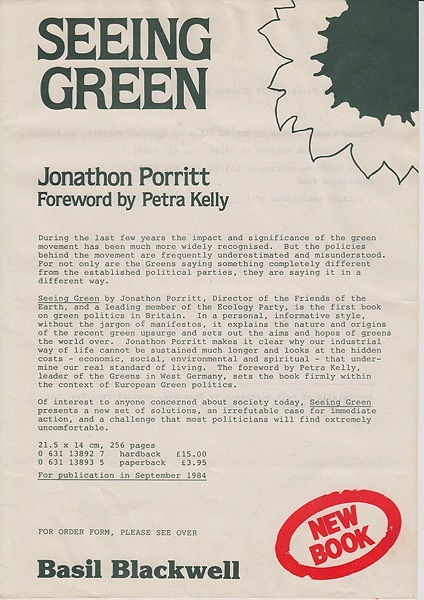 The collection includes material from the extraordinary decade between 1979 and 1989 when the Green Party went from just 500 members nationally to 2.3 million votes and 15% of the national poll. This site is an open resource for the use and support of today's activists, participants, researchers and all those with an interest in green ideas, thoughts and action. Only a couple of new articles during January as the main focus has been on uploading new documents to the archive. ALmost all of the Steve Lambert archive is now available, although indexing is, as always, far from complete. Descriptions and Contents need adding for almost all items, but initial tagging is complete. You can find a list of the Steve Lambert material here https://green-history.uk/library/doc-archive/category/tag?tagid=68. 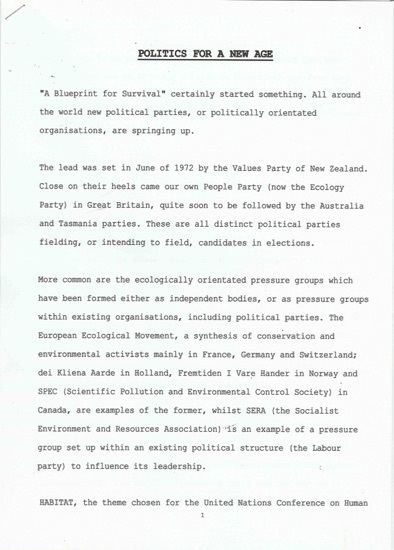 It starts with a 1975 "Statement of Aims" document from the Ecology Party and moves through a lot of material relating to the foundation and early days of the London Ecology Party which Steve and Jean were highly involved in. This includes some material from the successful long term campaign against transporting nuclear waste from Dungeness by train through the capital on its way to storage in Cumbria. Also included is a leaflet for Paul Tyler's 1976 by-election campaign in Walsall - the first national election entered by the EP and where many early activists were drafted in to help including Steve as a brand new member and David Taylor. Undoubtably this material will generate several interesting articles. 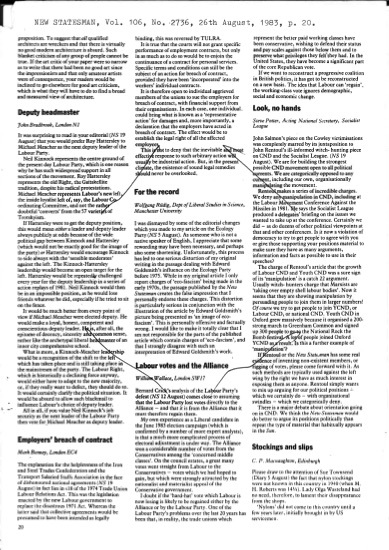 As well as London, the documents awaiting processing include some on the early days of Oxford and Bristol Eco/Green parties. We would also like to draw your attention to the articles on our Future Plans and the related Fundraising Appeal appeal. There is a lot of work to do and you can help very easily by using the Donate button on the left. As the size of the online archive slowly grows we are constantly trying to improve the way you can sift through both the archive and the articles to find material of interest. Both documents in the library and articles on the site are arranged into categories, which provide a hierarchical view, and are tagged so that items can be linked together across categories. In addition articles are arranged in a sequence within a category and can be linked to related articles anywhere on the site. At the foot of every article there is an information block which tells you the category, tags, adjacent and related items for the article. At the top of the page is a button Article Info which takes you straight down to the info block. There is a corressponding button Up to Top which floats at the bottom right of the screen as you scroll down to take you back to the top of the page. Three new articles and a couple of blog posts to draw your attention to this month. David Taylor has published a major piece on the The Green Collective - a different way of doing things. 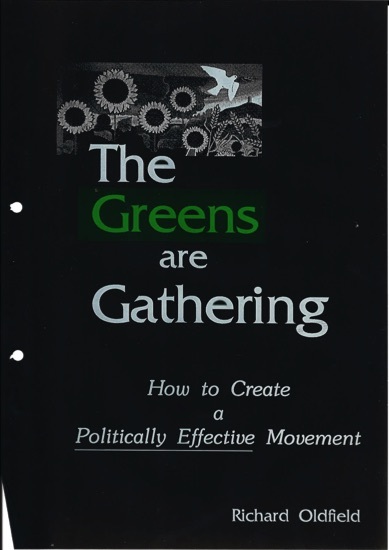 Andrew Pearman has contributed a detailed article looking at the reasons behind the rise of the Green Party in 1989 and including some interesting reflections on lessons for today. 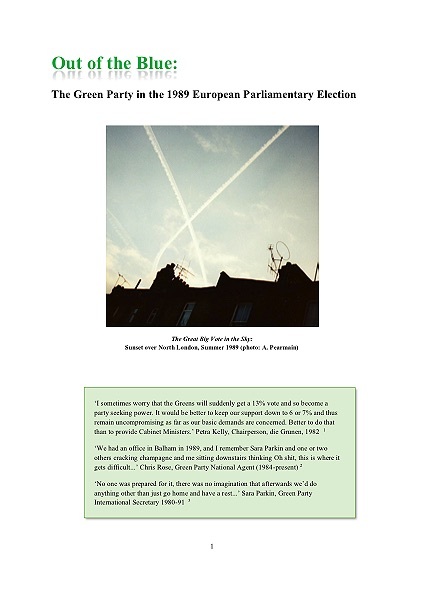 A synopsis is available here: Out of the Blue - The Politics of the Green Party, and the full paper can be downloaded from the Document Library. Both of these are grist to the mill of the Green School in February. A suggested reading list for the school will be published here before the Christmas holiday. Another topic that will form background for the school is the relationship between environmentalism and ecology - David has provided a brief blog post this month as a starter for the discussion. Roger's blog for November is concerned with the problems of organising and cataloging material on the site. In the Library area you will find an ever-expanding range of resources. The Document Archive contains scans of original paper. There are also collections of images, graphics, video and audio as well as a selection of recommended books and weblinks. We are always looking for new material - if you have anything from the period; a copy of your election leaflet from the time you were persuaded to stand for the council, a placard from a demo you attended, photos of some action, a poster you saved, or a cache of some obscure news letter/magazine you received, then do get in touch - info@green-history.uk. Under Articles, People and Elections in the top menu you will find contemporary accounts, more recent recollections, commentary and opinion. News, under Home on the menu, carries general news about the project, Article Updates, under Articles on the menu, lists new and updated articles, Library Updates under Library details new material added to the Library. History is subjective and we welcome debate, comment and opinion - if your memory or experience differs from that presented here then have your say - this is YOUR history. You can comment using the form at the bottom of most pages or contact us by email - info@green-history.uk.